This weekends market on Sat 3rd has a host of new stallholders; Lucy’s cake stall, Joaquim the Artisan Pastry Chef, Shuck brewery with their local ale and Venison from Graham. Fritton Owl Sanctuary will also be back with their beautiful feathered friends and we’ll be continuing our new regular raffle where you can win £30 worth of market goodies for just 50p! You’ve got till midnight on Wednesday to pre-book your market shopping from the Food Assembly including new seasonal locally sourced Asparagus. We had great fun at Beccles Food & Drink Festival last Saturday. There was 70 stalls including our very own Blackbird Cottage, Cakes to Celebrate, Clinks Care Farm, Nanna Lee’s Pantry, Opa Hay’s Brewery, Sea Breeze Asparagus, Season’s Bounty, Suffolk Smokehouse, Waveney Valley Smokehouse and The Norfolk Truffle Company. 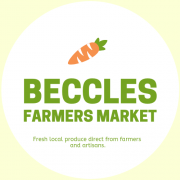 Lisa from Bespoke Bundles has been attending Beccles Farmers Market for the last 10 years. She makes beautiful alternative ethical presents with an ethos of re-cycle & reuse. We love her organic, fair-trade and locally sourced products included home blended soaps that use natural ingredients from my garden and hedgerow, organic citrus fruits, pure essential oils blended with organic olive oil. Her most popular products are Honey & Beeswax balm, lemongrass & loofah soap & hand tied cottage garden flowers when they’re in season. To celebrate being producer of the market she’ll be introducing cottage garden confetti for weddings/celebrations & more hand tied cottage garden flowers (sourced from less than 2 miles away).